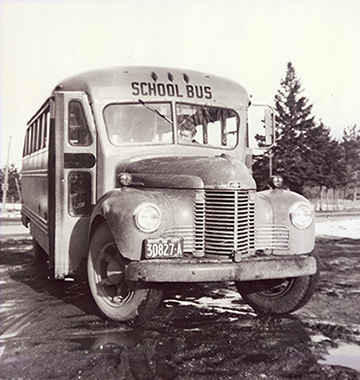 In 1952, an enterprising 16 year-old Floyd Sinton borrowed $900 from his father and purchased a 1949 International school bus. After getting it up and running, Floyd starting driving himself to school in the bus, decided to offer his friends a ride and in the process he founded what would become Sinton Transportation. Floyd’s son Stan was involved in the family business since the day he was born. Formally, he started in 1988. He diversified the company’s fleet by purchasing highway coach buses, limousines and transit buses. He grew the company’s school bus business in Simcoe County. He was instrumental in gaining the Colltrans contract in Collingwood and Wasaga Beach. He secured a contract in the summer of 2009 for 60 special needs school bus routes in York Region. Sadly, Stan passed away on August 18, 2009 after a valiant fight with cancer. The employees of Sinton Transportation continue to work hard to ensure we deliver the very best service to our customers. Stan taught us all to “Be Strong, Live strong, Be a Believer”. Landmark acquired Sinton Transportation in March, 2013.